The 2019 J.P. Morgan Tournament of Champions returns to Grand Central Terminal for the 22nd consecutive year as the second richest event on the PSA World Tour with a combined purse of $360,000 — the highest prize money in tournament history — held across an expanded nine days of match play between January 16-24 in New York City. 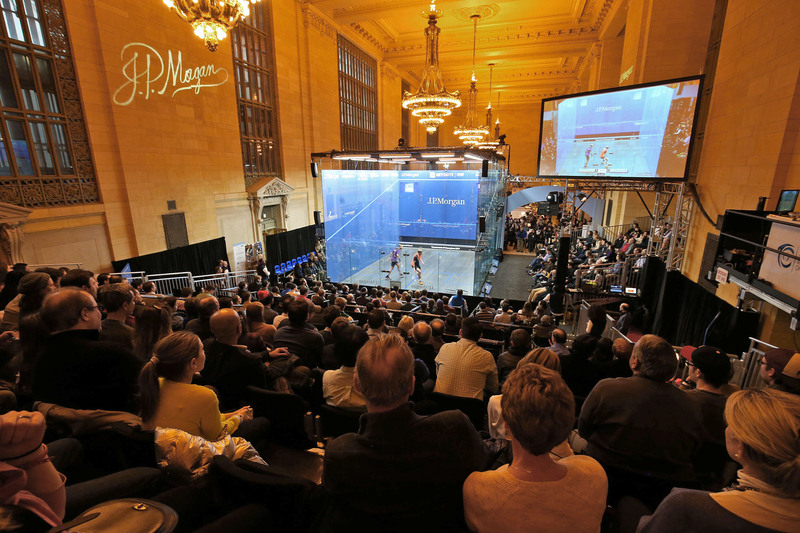 Since 1995, one of the sport’s longest-running and most iconic tournaments has attracted the world’s top squash players to the majestic Vanderbilt Hall in Grand Central. The competition will take place once again on the state-of-the-art Oracle NetSuite SuiteSuccess all-glass court. With its combined $360,000 prize money purse, the ToC leads the world’s top level Platinum events in the 2018-2019 season and is second only to the sport’s first million-dollar tournament, the 2019 PSA World Championships – which will be held in Chicago in February, 2019. The 2019 ToC has a new look following the new PSA Tour structure for the 2018-2019 season, which sees PSA World Platinum events employ 48-player draws with no qualifying rounds. To accommodate the new format, squash fans and passers-by will enjoy an additional ninth day of world-class squash in Grand Central from what had previously been eight days of glass court play. “Interest in squash has reached a new level, especially as squash lobbies to be the next new Olympic sport in 2024 or 2028, and it is only fitting that the world’s best known tournament here in the heart of New York City continues to increase its prize money, pay women and men equally and present more sessions to the public and to ticketed fans,” said Tournament Chairman and Founder John Nimick. The ToC welcomes its 12th year of title sponsor support from J.P. Morgan. Egypt’s Nour El Sherbini and Germany’s Simon Rösner are set to defend their 2018 ToC titles against the top-ranked players in the world. El Sherbini, World No.1, has her sights set on what could be an incredible third ToC title at just 23 years old. Rösner, World No. 5, made his breakthrough at the 2018 ToC when he captured his first career PSA World Platinum title in his 12th appearance at the tournament. The ToC is the only sports championship presented annually in Grand Central Terminal and is the sport’s oldest men’s professional tournament, dating back to February 1930. Player entries and draws are set to be released in December.